SEPOY (AUS) (Chestnut 2008-Stud 2012). 10 wins-5 at 2, ATC Golden Slipper S., Gr.1. Sire of 418 rnrs, 217 wnrs, 11 SW, inc. Alizee (ATC Flight S., Gr.1), Unforgetable Filly, Native Soldier, Indian Blessing, Marcel From Madrid, Dabyah, Kilmah, Divine Quality, Sparkle'n'joy, Baileys Showgirl, Khukri - Brilliant Debbie (Mac. ), SP Counterplay, Garrard, Han Xin - Sun Marshal (Sing. ), It's a Myth, Chipanda, Fullazaboot - Hello Beauty (H.K. ), Acqume, etc. Ramtastic (g. by Sepoy). Winner. See below. NAYELI (More Than Ready). 4 wins-2 at 2-to 1200m, A$352,975, MRC Chairman's S., Gr.3, City Tatt's RC Nivison S., Gr.3, ATC Fireball S., L, Membership on Sale 2YO P., 2d Scone RC Inglis Guineas, RL. Brightest (Galileo). 4 wins at 1300m, 1400m, A$238,525, ATC McCain Advantage H., Fujitsu General H., 2d ATC Summer Cup, Gr.3, Blackwoods Uvex Safety H., Chipping Norton Room H., Endeavour Recycled Clothing H., 3d ATC Inglis H., Foundation Membership H., Centennial Park H.
Watabout. 3 wins. See above. KAPHERO (Danzero). 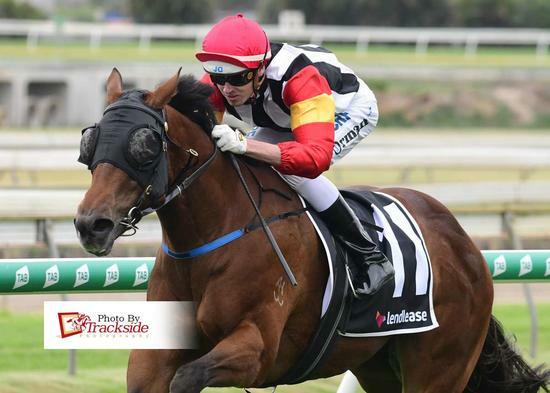 10 wins-3 at 2-at 1000m, 1200m, A$801,045, MVRC Ian McEwen S., Gr.3, MRC Blue Diamond Preview (c&g), L, SAJC Magic Millions Adelaide 2YO Classic, MVRC Carlton Draught Flying H., Logical Staffing Solutions H., Tatts Group H., TROA Trophy H., MRC Hilton Manufacturing Cup, 3d MVRC Manikato S., Gr.1. Sire. STAR OF GISELLE (Reset). 9 wins from 1000m to 1600m, A$654,325, SAJC Queen of the South S., Gr.2, MVRC Tesio S., Gr.3, MRC Mannerism S., Gr.3, Race-Tech Classic, L, VRC Isca H., MRC Echucamoama.com H., Orion Expedition Cruise H., SAJC Boag's Draught H., 2d VRC March S., L, MRC Selangor Turf Club H., Shadwell Farm Kentucky USA H.
SOLICIT (Street Cry). 7 wins to 1500m, A$1,183,600, VRC AV Kewney S., Gr.2, ATC Guy Walter S., Gr.2, 2d ATC Vinery Stud S., Gr.1, Apollo S., Gr.2, Expressway S., Gr.2, MRC Tristarc S., Gr.2, MVRC WH Stocks S., Gr.2, 3d ATC Coolmore Classic, Gr.1, VRC Oaks, Gr.1, VRC Wakeful S., Gr.2, Edward Manifold S., Gr.2. Ducal Castle (Domesday). Winner at 1200m, A$112,800, 2d VRC Better Beyond 2YO P., 3d VRC Hilton Hotels & Resorts S., L, MRC Blue Diamond Preview (c&g), L, 4th VRC Talindert S., L.
Kinetic Design (Master of Design). Placed at 2, 2d VRC Maribyrnong Trial S., L.
Keeneland (Danehill). 8 wins-1 at 2-to 1400m, A$48,250, 6,050Rgt., S$395,861, VATC Pelham H., Singapore TC Class 1 H., 2d Singapore TC New Paper Trophy, Class 1 H., 3d Singapore TC EW Barker Trophy, L, Class 1 H.
Wasimah (Danehill). 4 wins. See above. Tender (All American). 3 wins from 1100m to 1600m, A$125,495, ATC Tab.com.au H., McGrath Estate Agents H., 3d SAJC Dequetteville S., L, 4th SAJC National S., Gr.3. Race Record: 1 Starts 1-0-0 A$14,000. Winner at 1100m in 2018-19, BRC Retirement by Lendlease P.